If you are a coffee drinker, you know that there is just something about the smell of coffee. I like having a coffee maker with a timer because I can smell the brewed coffee in the morning when I get up and its ready for me and my wife. I usually buy whole bean and grind it as we use it. Sometimes we’ll make a cup in the afternoon too, mostly regular, but sometimes decaf. I like dark roast coffees best, but I’ll try lighter roasts. I don’t drink flavored coffees; just give me regular coffee, strong, not bitter, with one teaspoon of honey and a little cream. Man, I’m looking forward to tomorrow morning already. So my wife and I like to go on a date and try different coffee shops. We will visit them, see what their daily brews are and pick one to have. We have been in just about every coffee shop in Louisville. We like to see how the staff interacts with us so we usually ask them questions about the coffees and their store. We like to sit down enjoy the coffee, watch the people and talk with one another. 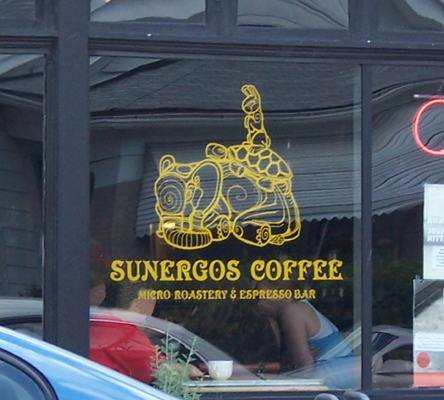 One of the coffee shops we really like is Sunergos. They are located at 2122 South Preston Street (www.sunergoscoffee.com). We like their coffee so much we buy the beans to make it at home. Sometimes though we just like to go there, sit down and enjoy the coffee. My wife likes to look at the art they have hanging on the walls and we like the eclectic mix of furniture. The staff is friendly and helpful. Saturday we tried what they call Blend B in a French Press. The coffee was stronger than being brewed in an auto drip machine. It had more of the coffee oils and grit in it then we are used too, but it was pretty good. In about a week we are going back to try the same blend in a Chemex brewer. We want to see how the coffee tastes with that brewing style. We are trying both of these because we are interested in purchasing one for home use. The staff helped us by answering any question we had. It was an enjoyable coffee drinking experience. We’ll definitely keep buying Sunergos coffee and brewing it at home. We’ll go to other coffee shops, but I know we’ll be back to Sunergos. We appreciate the products they sell and the friendliness of the staff. If you want some good coffee, go to Sunergos. I don’t think you will be disappointed. You can find them online at: www.sunergoscoffee.com . I posted this recommendation because we like supporting local small businesses. Oh yea, the date was good too! I’m looking forward to the next one we take to another coffee shop.